Cracking the GREoffers major features on DVD, including engaging video tutorials from The Princeton Review's top instructors. The 2008 edition includes over 300 practice questions in the book and exclusive free access to 4 practice exams and expert advice online. Of course, you'll also get all the test-prep techniques you expect from The Princeton Review.InCracking the GREwe'll teach you how to think like the test writers and Solve analogies even when you don't know the meanings of all the words in the problem Crack even the most complex algebra problems by plugging in numbers in place of variables Master even the toughest problems in the Verbal and Quantitative sections Learn directly from our teachers in a GRE strategy session on DVD We give you plenty of practice problems to help you master our proven techniques. 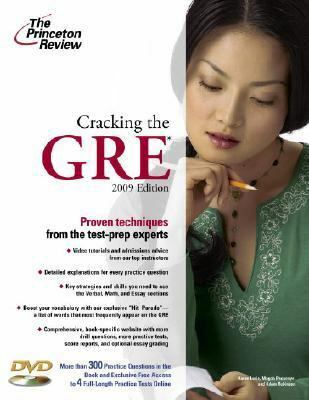 Our practice questions are just like those you'll see on the real GREbut with detailed answers and explanations for every question.Princeton Review Staff is the author of 'Cracking the GRE with DVD, 2009 Edition' with ISBN 9780375428647 and ISBN 037542864X.